Water is essential for life because it helps regulate body temperature, maintain blood volume and your body uses water to transport both nutrients and weight. In fact, an adult's body is about 55 to 60 percent water and lack of water intake or increased water loss will result in dehydration. How important is water? A person can only live a few days without any water. 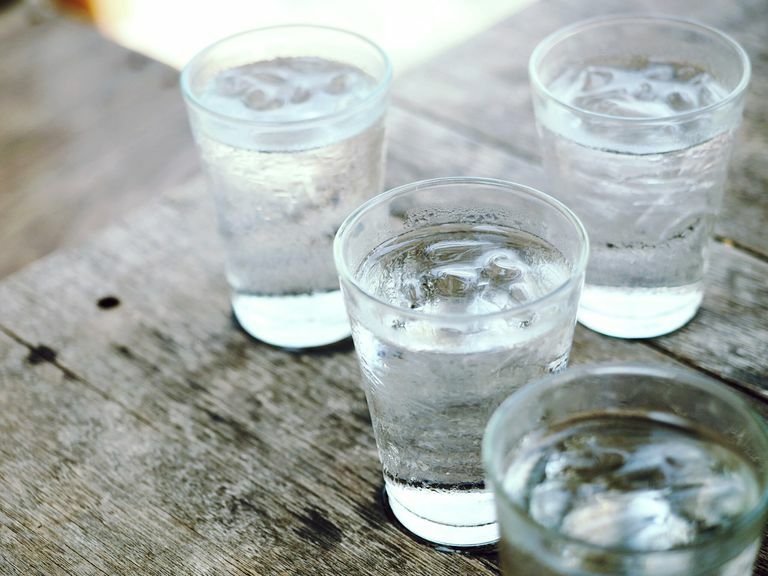 Water typically doesn't have any nutritional value beyond the water itself although you may get a few minerals such as calcium, fluoride, iron, potassium or sodium from a glass of water, depending on the source and whether or not it's filtered. Plus, you can buy flavored or enhanced water that contains a few added vitamins or minerals. Drinking plenty of water each day will ensure you get enough water for essential body functions. Also, drinking water will help regulate body temperature and keep you cool when you're in hot temperatures. Some research indicates that even mild levels of dehydration can impair physical function, or at least make you feel like it requires more effort on your part to do things. Rehydrating during physical activity can alleviate that feeling. Mild levels of dehydration can also affect your cognitive function and mood, so drinking enough water is also good for your brain function. Since water is calorie-free, drinking water can help you lose or maintain weight when you drink it in place of high-calorie beverages. Readers have so many questions about drinking water, here are some of the questions we're asked most often. The Health and Medicine Division of the National Academies of Sciences, Engineering, and Medicine recommends that adult women get about 91 ounces of water each day and that men get about 125 ounces of water. That includes all sources of water including the beverages you drink and the foods you eat. Most of the time, and as long as you're healthy, thirst can be your guide, so if you're thirsty, you require more water. It's possible that thirst mechanisms don't work ​as well in some older people, so it may be good for the elderly to drink water throughout the day. You'll need more water if you're in hot temperatures or if you're physically active, like during hard exercise or a labor-intensive job. Women who are pregnant and nursing moms need extra water as well. Just about everything with fluid counts as water, even dry foods like toast or crackers have a little bit of water. Some foods have more water than others, for example, soup and watermelons are very high in water. The National Academies say that about 20 percent of your water intake comes from the foods you eat. About 80 percent of your daily water intake comes directly from fluids including water, milk, soft drinks, juice, and even caffeinated beverages such as coffee and tea. Although any type of liquid or beverage counts as a source of water, be careful with less healthy drinks such as soft drinks and ice cream drinks that are high in sugar and calories, and energy drinks that can also be very high in caffeine. Does Putting Flavoring Like Crystal Light in Water Count? I Hate the Taste of Water—How Can I Make Myself Drink More? It's perfectly okay to change the flavor of water so it's more palatable to you. Aside from the commercial sugar-free flavorings, you can DIY by adding a slice or two of lemon or lime to a tall cold glass of water. Or you can add sliced strawberries, or cucumber, or fresh herbs. When it's cold outside and you want something warm, make some herbal tea. If it's the fizz you crave, buy cans or bottles of sparkling water. Do I Really Need to Carry a Water Bottle Around All Day? It's not mandatory, but you certainly do see lots of people taking water with them while they're on the go. Using a personal water bottle handy is a good way to keep up your water intake. Take a sip or two while you work, travel or exercise. Yes, you can drink too much water, but you probably won't, unless you gulp down a gallon or two all at once. Drinking way too much water too quickly leads to a condition called hyponatremia or 'water intoxication.' When that happens, the sodium levels in your blood drop way too fast and will make you sick. This is a medical emergency and can be fatal. It's easy to avoid hyponatremia by drinking a glass or two at a time and spread your water intake throughout the whole day. Popkin, B. M., D’Anci, K. E., & Rosenberg, I. H. (2010). "Water, Hydration and Health." Nutrition Reviews, 68(8), 439–458. The Health and Medicine Division of the National Academies of Sciences, Engineering, and Medicine. "Dietary Reference Intakes: Water, Potassium, Sodium, Chloride, and Sulfate." Published February 11, 2004.